Cultural Wormhole: Lights Out - "Pilot"
Even in retirement, Patrick "Lights" Leary (Holt McCallany) still likes to hit people. In the past decade, we've seen some great characters on television that are both hero and villain of their own story. Probably the most notable has been Tony Soprano. While he was the central character in 'The Sopranos' at times it seemed like Tony was his own arch-nemesis. Sure, he had antagonists, both noble and not, but our "hero" was far from being a good guy. Most recently, Nucky Thompson on 'Boardwalk Empire' has filled a similar role. What helps make these characters attractive too has been the outstanding acting from James Gandolfini and Steven Buscemi. Now, I wouldn't go as far as to call Patrick "Lights" Leary evil, but he's certainly feels like his own worst enemy. Like Soprano, Leary loves his family and wants to provide for them. Unfortunately, a weak economy, failing business pursuits, and fade of his star power have begun to have detrimental effects on his life. Another problem he has, as he admits in an interview, he sometimes misses hitting people. It isn't until near the end of the episode and through a quick series of flashbacks of the previous day, that we really get to see what kind of man Leary is. He lets an idiot at the bar challenge him to a fight for money. It's not contest, but Leary continues to beat on the man, even after it's crystal clear that he won. It was a smart move to let the other guy land the first punch; that could have (and may still) turned into a nasty lawsuit. Then there's Leary's handling of the situation with the dentist that owes a bookie some money. When the doctor threatens him with a baseball bat, Leary is completely condescending. "Good for you," he says, "defending your home." Leary says it as if he's speaking to tiny, yapping dog that barks at anyone or anything that comes into his yard, no matter the size. This doesn't stop Leary from dislocating the man's shoulder, though. 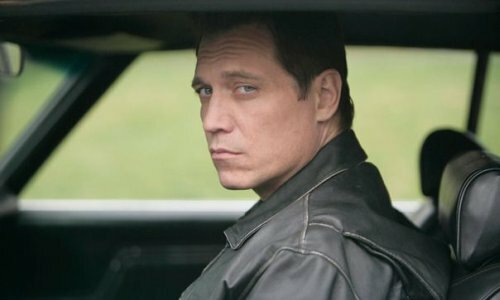 Leary is capably played by Holt McCallany. The man has a very convincing presence as man that is both charismatic and physically intimidating. Yet, in his scenes with Leary's wife, three daughters, and nephew, the man has a lot of heart. He's quick to apologize to his nephew after brushing him off and makes it up to the kid by the end of the episode by playing with him in the ring. Unfortunately, he's not completely truthful, either. He has two scenes, one with his oldest daughter and the other with the youngest, where the message is basically do as I say, not as I do. I can't help but feel for Leary's wife, Theresa (Catherine McCormack). She told Patrick to give up boxing or her. He chose her and he paid for her medical school. Now Theresa is just beginning her career now that school has wrapped up. She's going to be making money, but no where near enough to sustain the lifestyle supplied by Patrick's earnings. While it's not overly vocalized, just about everyone else in Patrick's life blames her for his retirement and subsequent financial downturn. The rest of the main cast is rounded out by Pablo Schreiber as Leary's younger brother, Johnny, and the always reliable Stacy Keach as their father. Johnny has been given the Sisyphean task of managing Patrick's business affairs and lining up work for the ex-heavy weight champion. When even a bingo calling gig dries up and potential real estate partners run out, all that's left for the moment is the aforementioned collection job with the dentist. Papa Leary seems to be in an eternal state of denial about things. He loves the gym but refuses to acknowledge that it is a money sinkhole. He obviously holds a grudge against Theresa, which translates into excuses to not come out to the suburbs and visit his three granddaughters. At least, he's not as cruel and mean as the father role he played on 'Titus' about a decade ago. 'Lights Out' is off to a really solid start. The pilot did its job by firmly establishing who Patrick Leary is and the current circumstances of his world. Between Leary's financial problems, his potential return to the ring, and his inability to completely contain the fighter within, there's good amount of story potential there. FX has been on a role lately creatively. 'Justified', 'Archer', and the sadly now-cancelled 'Terriers' have been very distinct and entertaining programs. 'Lights Out' looks like it will be added to that list.